Easter’s coming! 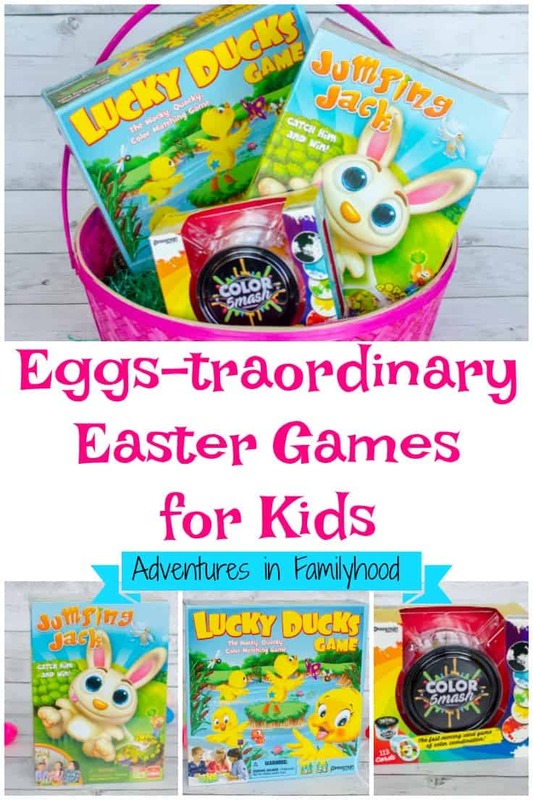 Have an eggs-traordinary time with your family when you play these Easter games from Goliath and Pressman Games. We received these games for free in order to facilitate this post. All opinions are our own. Easter is one of the holidays when we’re lucky enough to have the whole family together. It’s the perfect opportunity for a family game night. We need games that will appeal to every member of the family, from adults to toddlers to tweens. These games from Goliath and Pressman Games are fun for the whole family. 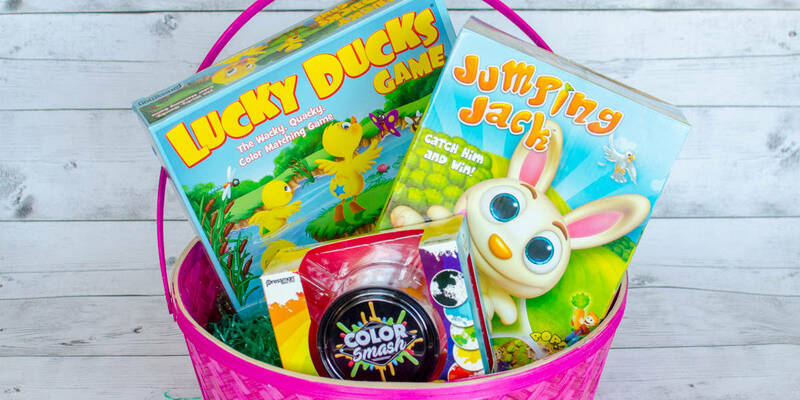 They are sure to give a POP of fun and creativity to your Easter celebration. The three games I’m going to show you take your classic Easter and springtime to a whole new level. What is Easter without the Easter Bunny? 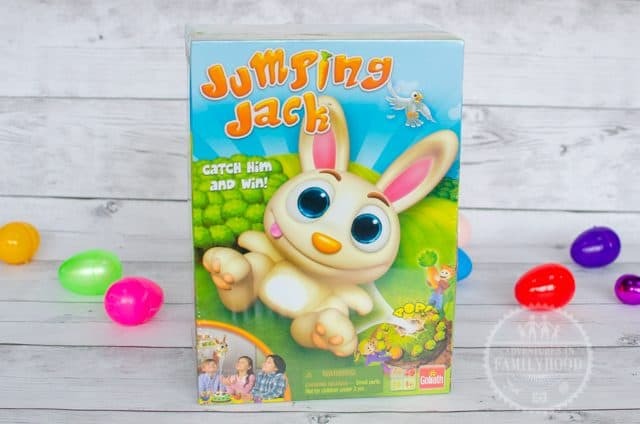 Well, in this case it’s Jack the Bunny in the new game Jumping Jack. Kids take turns pulling carrots from Jack’s bunny hill. But watch out! One of Jack’s carrots will make him jump high into the air! This high excitement, suspenseful game teaches helps reinforce taking turns, counting, hand-eye coordination and quick reactions. Lucky Ducks is a classic in our house. We’re excited to introduce this memory and matching game to the littlest member of our family. 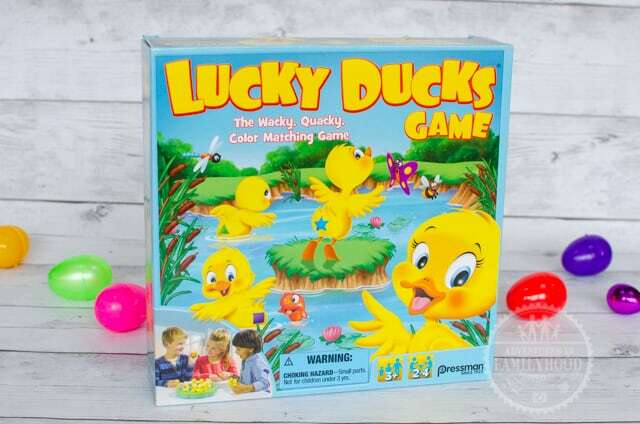 Lucky Ducks is a modern version of the classic memory game. Instead of staying still, the ducks swim around their pond as you try to make a match. Players are assigned their own color and shape. On your turn you pick up a duck, looking at the color and shape. If it matches yours, you keep it. Lucky Ducks is a wacky. quacky game that helps kids with color and shape recognition, memory and taking turns. Something we love to do at Easter is color eggs. Springtime is all about flowers blooming and color popping up all over the place. That’s why Color Smash is the perfect game for Easter. 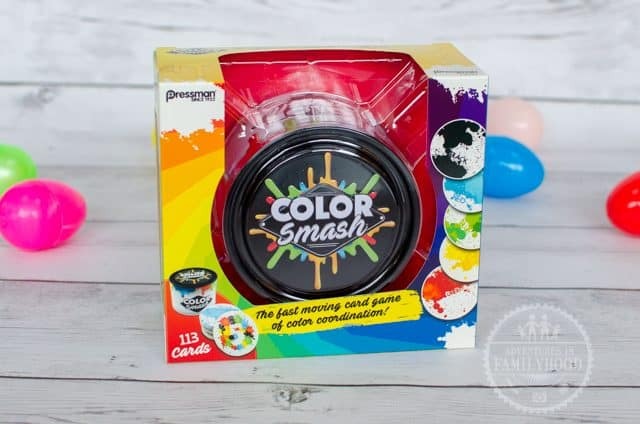 Color Smash is the fun, fast card game of color coordination and fast reflexes! Players take turns laying their splats on the stack, until there is a splat with the word on it then SLAP! Be the player to collect the most cards to win! The cards come in a portable “paint can” which makes the game perfect for travel. Keep it in your backpack, suitcase or purse for spontaneous family fun!